I am excited to lay hands on Colonial Culture in France since the Revolution! Published by Indiana University Press in November of 2013, this ambitious book gathers together articles written by an international and interdisciplinary group of scholars, writers, and intellectuals. Colonial Culture in France treats of a multi-faceted historical system, mobilizing a term, colonial culture, to describe “the foundations and origins of the contemporary cultural, political, and social landscape” and the ways in which such a system continues to inform narratives of identity, memory, and history. This collection, which opens on a discussion of abolitionist movements in the mid nineteenth century and ends with reflections on present day issues, offers the reader a long and detailed view of the postcolonial situation in France, with articles on such diverse topics as education, science, exhibitions, cinema, sports, propaganda, and tourism — to name but a handful. Colonial Culture in France is available both in hardcover and as an e-book. arranged chronologically, according to the date of the events described. This is such a wonderful book, and together with my co-translator, Antoine Bargel, I am delighted to make three newly translated pieces available to the anglophone world: Yasmina Khadra’s The Writer (excerpt); Christian Dumoux’ Childhood in Madagascar (excerpt); Tahar Ben Jelloun’s The Fraternal Bond (excerpt). 1. As of January, I am now a member of the American Literary Translators Association (ALTA), a dynamic network of translators, writers, and scholars, which seeks to further cultural exchange through the craft of literary translation. ALTA promotes literary translation through a number of top-notch publications and at an annual conference, which will take place this year in Bloomington, Indiana. Here’s a link to their site: http://www.utdallas.edu/alta/. an anthology of memoirs and autobiographical texts, written by some of the finest writers from across the African continent and spanning several centuries. I had the distinct pleasure of working with editor Geoff Wisner and fellow translator Antoine Bargel on three incredible texts for this anthology: Tahar Ben Jelloun’s “The Fraternal Bond”, Christian Dumoux’s “Tenth House”, and Yasmina Khadra’s “The Walls of El Mechouar”. This book can be purchased at Barnes & Noble online for a 32% discount. 3. In April, I head to London for the London Book Fair. I am really excited to participate in this annual industry event, which brings people together from all aspects of publishing in a three-day marathon of seminars, conferences, exhibits, etc. I particularly look forward to meeting fellow translators and reconnecting with acquaintances. Find me there at the Literary Translation Centre! 4. Late November will see the publication of Colonial Culture in France since the Revolution by Indiana University Press, a book I spent the better part of 2012 translating, and which — thanks to its breadth — makes for a thought-provoking and informative read. The 600-page collection of essays features pieces by an international group of scholars and intellectuals on the history and continued relevance of the French colonial project. You can purchase this book directly from the publisher. 5. As an advocate of all forms of book production — from the early manuscript to today’s e-book — I am delighted to be working with French publisher Aux Forges de Vulcain on an e-pub English translation of François Szabowski’s wonderful serial novel, Women Don’t Like Men who Drink. The book follows the fantastic adventures of a modern Frenchman who moves mountains to find meaningful employment. But his plots and ruses end in catastrophe, forcing him to live off the system and take advantage of the people around him. You’ll learn to love the loathsome character in this entertaining social satire! Keep an eye out for the first installment of the e-book later this year. If you’re in Los Angeles during the weekend of November 9 to 11, I highly recommend checking out the Armenian Print Conference, hosted by UCLA’s History Department. I’ve just finished up work on some really interesting papers dealing with the transition from manuscript to print culture, book distribution in early modern Europe, and the trajectory of Armenian printing practices from the sixteenth to the nineteenth centuries. 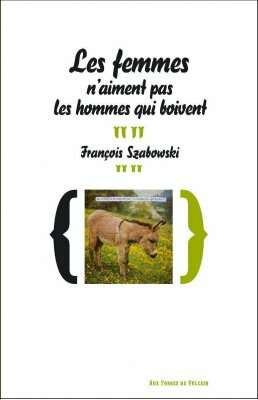 As an advocate of all forms of book production — from the early manuscript to today’s e-book — I am delighted to be working with French publisher Aux Forges de Vulcain on an e-pub English translation of François Szabowski’s wonderful serial novel, Women Don’t Like Men who Drink. Born in 1977, François Szabowski is the son of a Russian mother and a mustachioed father. He has worked as a florist, a carpenter, an archivist, and a caregiver for the elderly, and now devotes himself full-time to writing. Traductrice franco-américaine, je propose des traductions et des corrections haut de gamme qui sont adaptées aux besoins spécifiques de mes clients. Veuillez me contacter avec les détails de votre projet. Je serai ravie de travailler avec vous! Yale French Studies published an issue last fall (2011) on “Francophone Sub-Saharan African Literature in Global Contexts“, in which appear articles by scholars and writers from diverse backgrounds on various mutations and transformations in Francophone sub-Saharan literature, particularly with respect to globalization. Among others, see the piece I translated by Cilas Kemedjio titled “The Suspect Nation: Globalization and the Postcolonial Imaginary”, in which the author “addresses the tenuous links between nation-building and diasporic formations, nationalism and transnationalism, and therefore globalization itself” (Editors’ Preface, 7).